Paul wrote almost half of the New Testament, so people who believe he was a fraud do not obey the writings of Paul. Many of them also believe that 2 Peter is fraudulent, which just happens to support Paul’s apostleship. Others have doubts about some of John’s writings. However, most accept Luke’s Gospel and at least the first part of Acts, also written by Luke who was mentored by Paul. When we last saw Saul he was preaching in synagogues in Damascus that Jesus Christ is the Son of God. 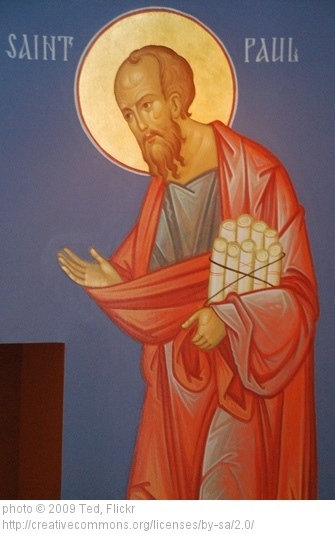 He “confounded the Jews who dwelt in Damascus, proving that this Jesus is the Christ” (Acts 9:22). The Jews were confused by this for a short time because they recognized that Saul was the same man who the chief priests had sent from Jerusalem for the express purpose of arresting followers of Christ to take them back to Jerusalem for trial. It wasn’t long before the Jews in Damascus had enough of Saul’s preaching and plotted to kill him. However, Saul found out about the plot and the Lord’s disciples took Saul by night “and let him down through the wall in a large basket” (Acts 9:25). Saul headed back to Jerusalem and tried to join the disciples there, but they were all afraid of him. They did not believe that Saul was a disciple of Christ. “But Barnabas took him and brought him to the apostles” (Acts 9:27). The evidence for Paul’s apostleship is about to gain more strength. So, let’s review a little history to see the impact of what just happened. As a former investigative journalist it was important for me to discover connections and corroborations. What connected to what, who connected to who, what and who corroborated what and who. Investigating a news story is often like putting together the pieces of a big puzzle, but eventually the pieces came together and the picture was clear. We’ve already seen how Jesus connected to Paul, Jesus connected to Ananias, and Ananias connected to Paul. Then Ananias, who was connected to the other disciples in Damascus, connected Paul to the disciples in Damascus. The fact that Jesus spoke to Ananias and told him about speaking with Paul was corroboration for Ananias speaking with Paul about what Jesus had told him about Paul and his future as an apostle of Christ. The puzzle pieces are coming together. Saul leaves Damascus and heads back to Jerusalem. He wants to talk with the apostles and disciples there. However, they want no part of Saul. That’s what I would expect to find. Why would the apostles and disciples in Jerusalem, who knew Saul and the terror of his persecution of Christ followers, want to meet with him? I would be suspicious of the accuracy of the story in Acts if they had acted differently. Anyone who shows up in the first four chapters of Acts is one of the early disciples of Christ. Barnabas is mentioned right after the first arrest of the apostles as being someone the apostles knew well enough to give him a special name, Barnabas – Son of Encouragement. That means Barnabas (Joses) had been a disciple of Christ long enough to have earned that reputation with the apostles. That also means Barnabas would have been close to the apostles and deacons when Stephen was arrested and killed (Acts 7). Barnabas would have experienced some of Saul’s persecution and would have known how dangerous Saul was to followers of Jesus Christ. Barnabas was a Levite from Cyprus and also a land owner. He sold his land and gave the money to the apostles. That’s what the disciples did in those early days of being a Christ follower. It’s important in our investigation of Paul’s credibility to witness the strong and enduring credibility of Barnabas with the 12 Apostles. They trusted Barnabas and appreciated his love for Christ and those who were following Christ. It is Barnabas’ love for Christ and His followers that leads us into this exciting new chapter about Saul (Paul). All of the disciples in Jerusalem were afraid of Saul and did not believe he was a disciple of Christ. Barnabas would have understood that because he had also felt the sting of Saul’s earlier persecution of the disciples. So, what was it that changed Barnabas’ thinking about Saul? What could have changed Barnabas’ thinking about Saul? Why would Barnabas trust Saul enough to want to take him to meet with the apostles? One possibility is that Ananias introduced them. Ananias would have understood how difficult it would be for the disciples and apostles in Jerusalem to just take Saul at his word about his conversion. Ananias may have traveled to Jerusalem with Saul and sought out Barnabas, knowing his spiritual giftedness as an encourager and how the apostles trusted him. Barnabas probably knew or knew about Ananias and would have accepted his word as true. Another possibility might be that Ananias sent one or more trusted disciples from Damascus with Saul carrying a personal letter of introduction from Ananias to Barnabas or the apostles corroborating Saul’s story about the Lord speaking to him, and his preaching boldly about the name of Jesus in Damascus. Yet another possibility is that Jesus or the Holy Spirit revealed Saul’s conversion directly to Barnabas in a vision or dream, though I think Luke would have included that fact in his record. Let’s add more connections and corroborations to our investigation. Barnabas was an early disciple of Christ in Jerusalem and knew the 12 Apostles well. More importantly, they knew Barnabas well and included him as an important part of the Jerusalem congregation. Barnabas meets with Saul, is convinced of his true conversion, and takes Saul to meet with the apostles in Jerusalem. Barnabas —> Apostles —> Barnabas —> Saul —> Apostles —> Christ Jesus —> Saul —> Ananias —> Christ —> Apostles. The connections and corroborations just keep getting stronger and the evidence is mounting. Saul ran into major problems in Jerusalem. He spoke boldly in the name of the Lord Jesus and disputed against the Hellenists, but they attempted to kill him. When the disciples found out, they took Saul to Caesarea and sent him to Tarsus. Interestingly, the disciples throughout all Judea, Galilee, and Samaria had peace and were edified. They walked in the fear of the Lord and in the comfort of the Holy Spirit and multiplied (Acts 9:28-31). Why was that? Saul was the chief priests’ top prosecutor and enforcer. What happened to the persecution of Christ followers when the chief persecutor became a follower of Jesus Christ and removed from the area? Apparently, a brief period of peace for believers while the priests came up with another plan of attack. While Saul was back home in Tarsus receiving multiple visions from God about the ministry to which he was being called (2 Corinthians 12), Jesus moved forward with His bold, new plan to open the door for Gentiles to come to faith in an unexpected and previously hidden way. What the Lord did through Peter would also prepare the way for Saul to accomplish the goals Jesus revealed to him in Damascus. Join us next time as we investigate whether Paul was an apostle or a fraud. Although I am not an investigative journalist, I am an enthusiastic and educated reader who understands the value of corroborative evidence. While reading your viewpoints and pondering your evidence, I see myself as a juror who is weighing the value of the evidence provided. As a juror, I am not taken by evidence that requires one to place their trust in the character and word of the defendant (Saul of Tarsus). His weakness, in reality, is what he considers to be his strength – secret revelations and private meetings from the risen Christ, which cannot be corroborated by anyone. Like Joseph Smith, Jr. – you either believe him or you don’t. As an educated reader and thoughtful juror, I noticed that, once again, the defense is using witnesses and corroborations from their own camp. This is like trying to verify the authority and trustworthiness of the Reverend Sun Myung Moon by interviewing his devout followers (“Moonies”).